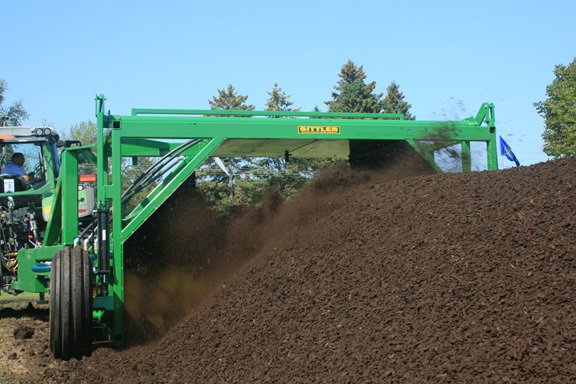 Turning compost times may be determined by temperature of the windrow. A 4' probe thermometer is provided by Global Repair Ltd. with the purchase of a Sittler windrow turner or may be purchased from us. Please go to our Compost Accessory page for details. We strongly recommend using a thermometer with readings from 0 degrees to 200 degrees F to monitor compost piles or windrows.Temperature should be taken frequently. In the first week most temperature spikes occur. During this period it is advised that you take temperatures at least twice daily. With proper formulation, within the first few days you will notice a steady rise in temperature in a new compost pile as the microbes reproduce and the process of breakdown accelerates. If the material is too wet, the temperature may remain quite cool and constant. Wet material can be dried by turning more frequently until the temperature begins moving up. However, compost that has over 60 % moisture is usually too wet to turn and will smear. Proper formulation with wet and dry ingredients, correct C:N ratio and the use of fleece covers helps you control the moisture content of the compost. For areas that receive excess rain, or large operations, open ended buildings may be required. For more information please see our Compost Online Management Batch Tracking Services.